WORLD GUITAR DAY: Get your solos off to a banging start with our easy lead guitar lesson, starting with the most essential guitar scale of them all - the E minor pentatonic. Most of the ideas in our lesson use notes from this essential guitar scale so make sure to practise it before trying out the musical examples. Play one note at a time starting on the lowest note and go up to the highest. Dots tell you which string/fret to place a finger at; numbers tell you which fretting finger to use. We've also given you the chord shapes, just in case you want to strum along to our backing track. When you're ready, move on to the soloing exercises below. Black Label Society axe man Zakk Wylde opens Concrete Jungle with this technique, wringing merry hell out of his Les Paul with long, sustaining string bends and a talkbox effect. For our example simply place your third finger at the 2nd fret and slowly bend the string until it sounds the same as the 4th fret on the same string. We've followed the bend with two more notes and a pick scrape down the strings. If you have one, use a distortion pedal for extra sustain and attitude. This idea earns its 'legendary' moniker because its simple formula has kicked off dozens of classic guitar solos (Led Zep's Stairway To Heaven, Dire Straits' Sultans Of Swing and Cream's White Room to name a few) and you can easily add it to your own arsenal of techniques. Simply start with a string bend then run up or down through the minor pentatonic scale. Our example starts high and then descends the scale, but experiment to fi nd your own ideas. Say 'guitar solo' and many people's first thoughts are of wailing string bends and lightning fast flurries of notes played high up the neck. 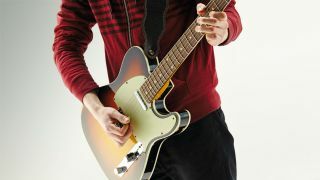 Using your guitar's bass strings may not always be flashy, but it is a great way to start a solo or introduce a new section. Angus Young used this trick to bring in the solo in Back In Black and Jimi Hendrix led out of his solo in Hey Joe with a bass string run. Here, we're playing a slide down the sixth string before landing on some choice bass notes. Using notes that are contained within chords you are playing over is a great alternative to the minor pentatonic scale. It also guarantees that the notes you choose will 'fit' with the backing chords. David Gilmour does this masterfully in the first solo in Pink Floyd's Comfortably Numb, albeit an octave higher than the guitar chords. Don't worry about the theory though; just follow our tab and you'll see that every note we've played comes from the chord shapes. Blues-rocker Eric Gales introduced us to this 'down the stairs, up the stairs' idea. The idea is to use the minor pentatonic scale to play a lick that starts high and gradually goes lower - we've run through the minor pentatonic notes from the first string down to the open fourth string. To complete the downstairs/upstairs approach simply repeat the line in reverse. This is a great way to open a solo but you can easily mix in with other lead ideas. For example, try kicking off with a string bend or adding a pick scrape. Now you've mastered these solo starting points, try moving on to our 8 essential blues guitar lead tricks.